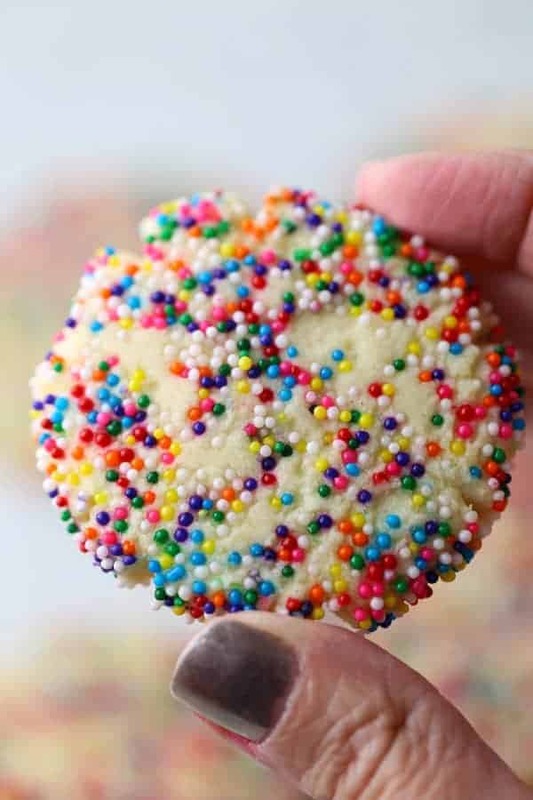 This Rainbow Sprinkle Sugar Cookies post was sponsored by Stevia In The Raw®. All opinions are 100% my own. The holidays are here, and the cookie baking is in full swing at my house. 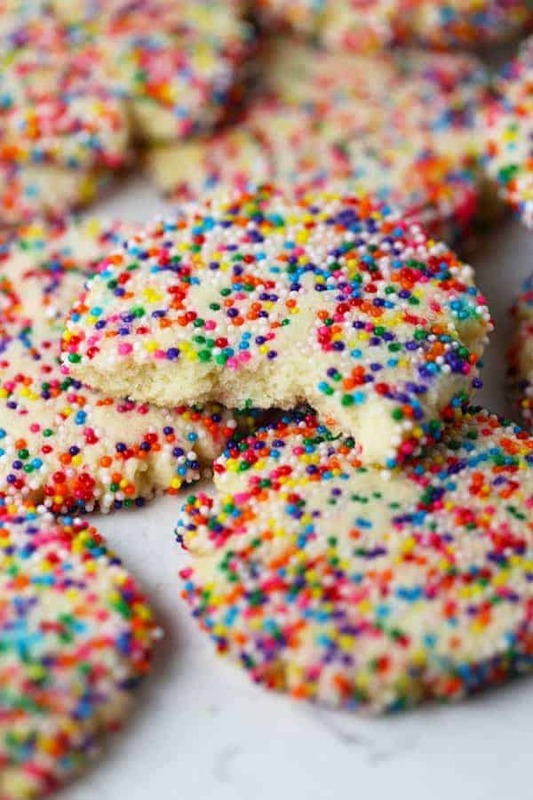 The kids love these Rainbow Sprinkle Sugar Cookies – especially my son, he’s a very big fan! They would be great for a neighbor or teacher gift too! Put them on a pretty plate, cover with clear plastic and stick a bow on top. Voila! A tasty gift for someone special this holiday season. 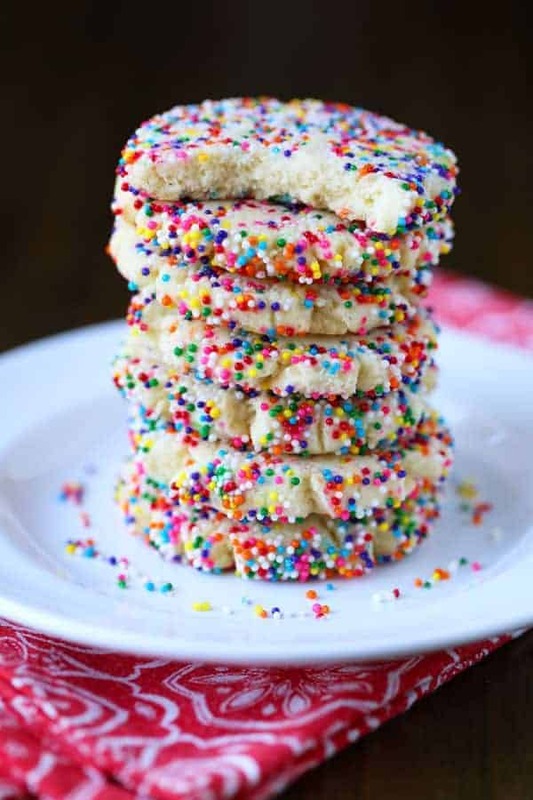 I like how simple they are to make with just a few ingredients, and the rainbow sprinkles are so colorful! If you wanted to make them more hoilday specific, you could use red and green sprinkles for Christmas or pastel colored sprinkles for Easter and so on. I used non-pareils but you could use any sprinkles you like. I have a little secret to share about these cookies. I replaced half the sugar with Stevia in the [email protected], and my family didn’t even know it! (Shhh, don’t tell.) Isn’t that cool?! Same great taste, but less sugar! It’s a win win in my book. 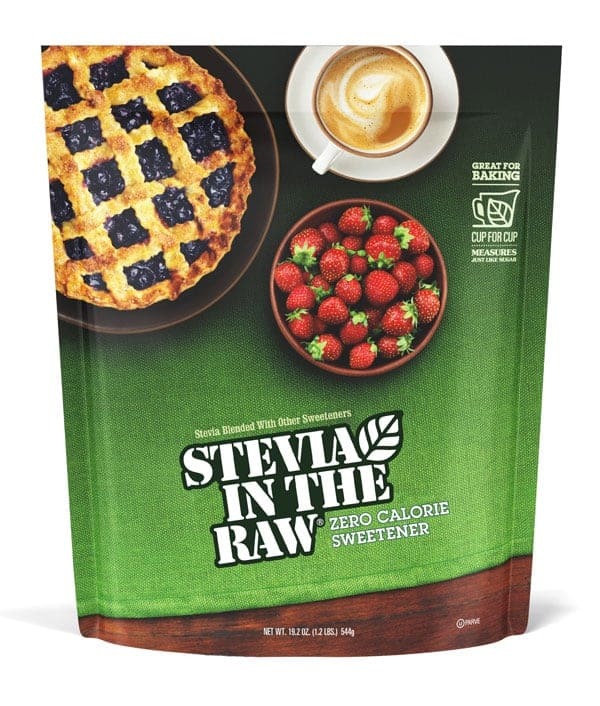 Stevia In The Raw® is a zero-calorie sweetener, perfect for any baking and cooking needs. 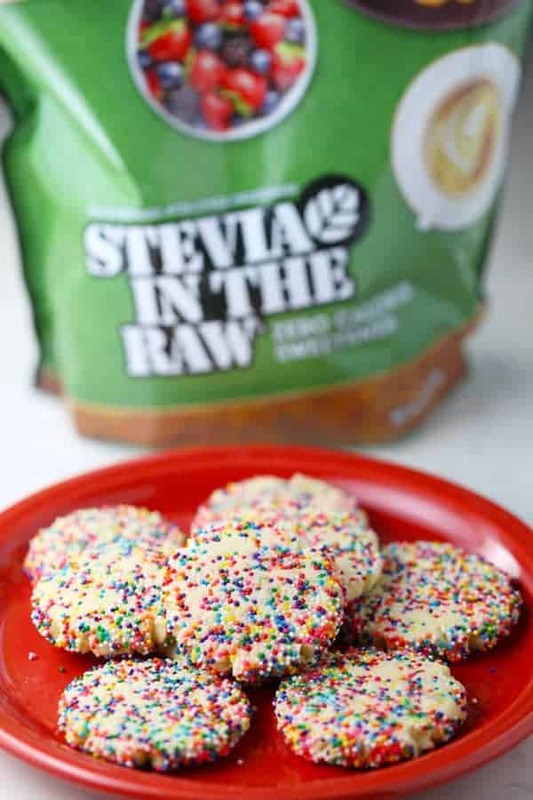 Stevia In The Raw® Bakers Bag is formulated so that 1 cup has the same sweetness as 1 cup of Sugar. For every cup swapped, you can save up to 700 calories! 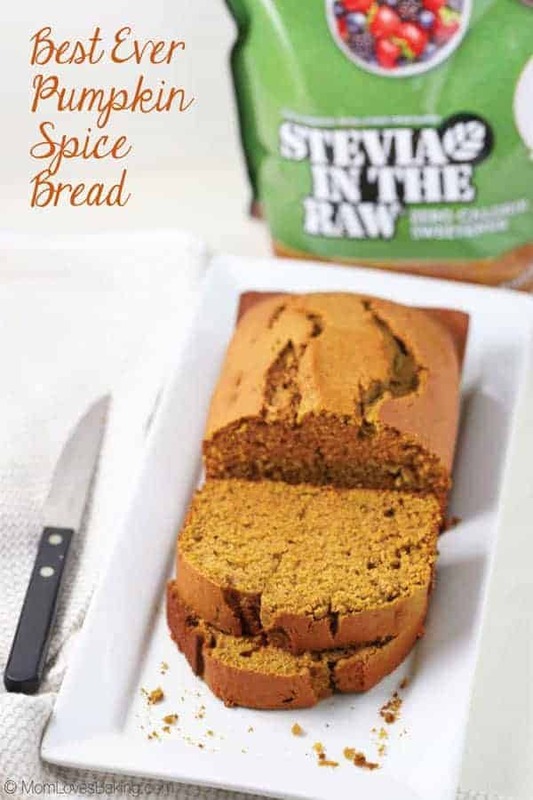 Even though you may be tempted to replace all of the sugar with Stevia In The Raw®, I recommend keeping approximately half of the regular sugar in any baking recipe to get the browning, rising and caramelizing that only sugar can provide. Start with softened butter in a large bowl. With an electric mixer on low, add the sugar, Stevia in the [email protected] and flavorings. Turn it up to medium and beat for 3 minutes. Then you add some flour and salt and beat until it forms into a ball. With floured hands, knead the dough in the bowl for just a minute. Then you shape the dough into twenty four 1-inch balls. 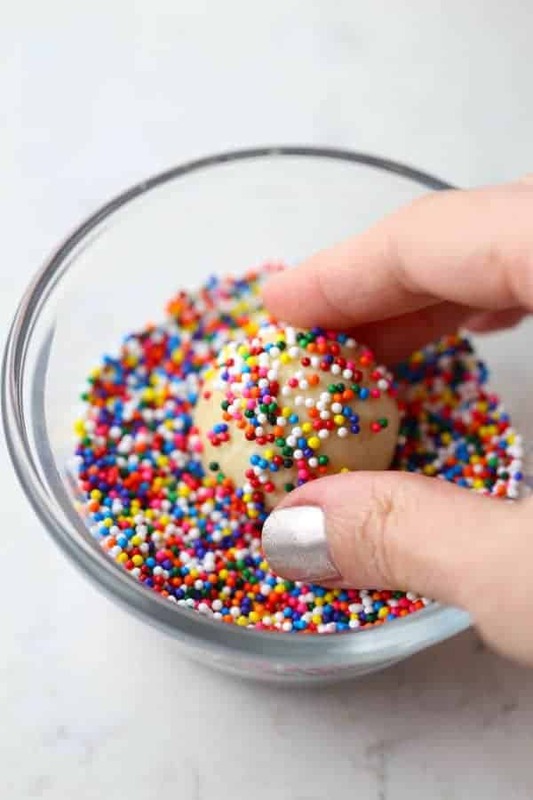 Dip cookie dough balls into a bowl of sprinkles. 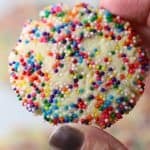 If the sprinkles aren’t sticking, you can use wet fingers (dipped in a small bowl of water) and dampen the cookie dough slightly. Just enough for the sprinkles to stick. Note: don’t use too much water or you will have a sticky mess. 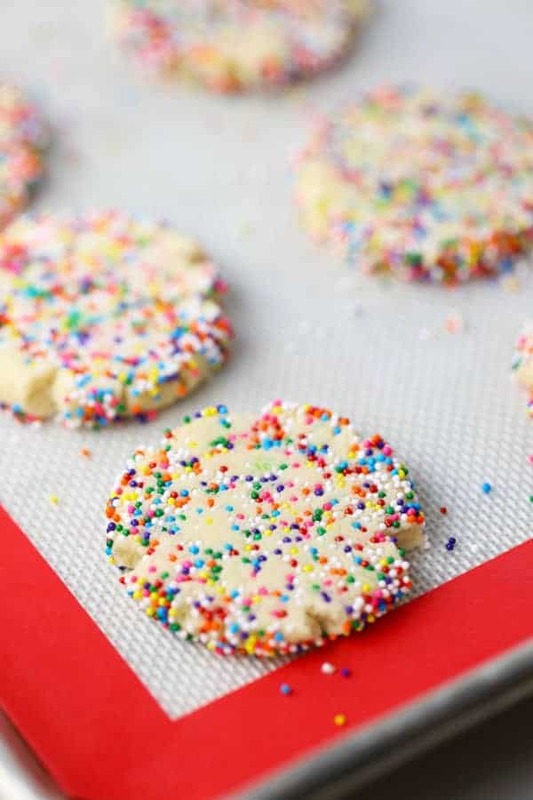 Place the sprinkle cookie balls onto large cookie sheets lined with parchment paper or a silicone baking mat (I like to use 13″x18″ half sheet pans with a raised edge, so cookies don’t slide off). Flatten balls slightly with the bottom of a measuring cup. Bake at 375°F. for 10-13 minutes. I hope you will try these adorable little cookies this holiday season. And get the kids to help – baking with family and friends is so much fun, especially during the holidays! Do you have a cookie baking tradition at your house? What’s your favorite cookie to bake? 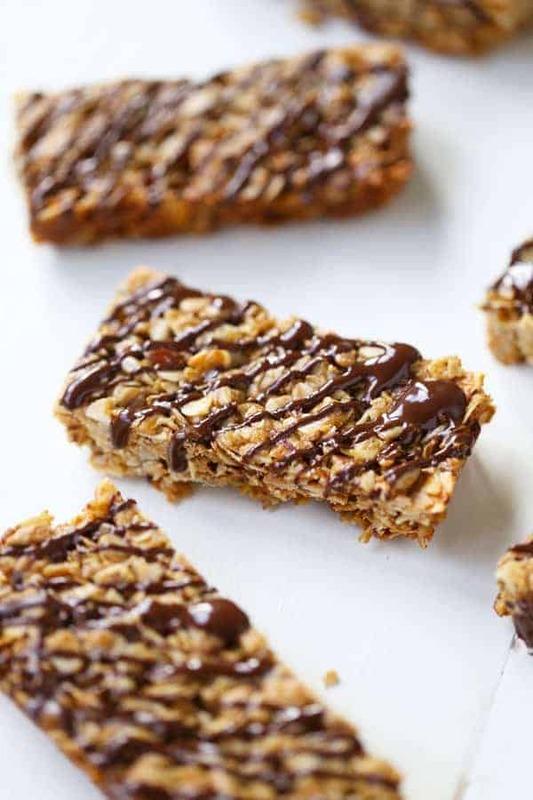 For more sweet treat inspiration that allows you to “Half Your Cake and Eat It Too,” check out this new, FREE ecookbook from Stevia In The Raw®. Line two large cookie sheets with parchment paper (I like to use 13"x18" half sheet pans with a raised edge, so cookies don't slide off). Set aside. In a large bowl, add butter, powdered sugar, Stevia in the [email protected] and flavorings. With an electric mixer, beat on low until combined, then turn up to medium and beat for 3 minutes. With mixer on medium low, gradually add flour and salt. Once the flour and salt are added, turn mixer up to medium and mix completely. 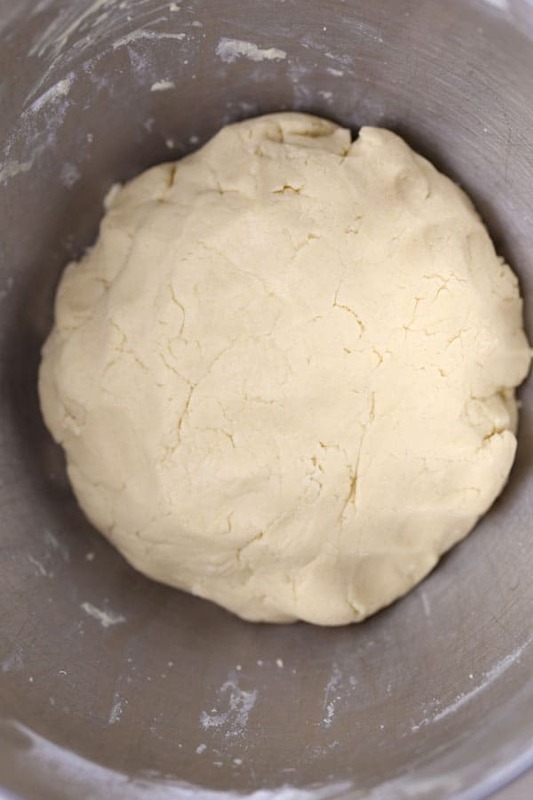 With floured hands, knead dough for a minute and form into a ball (in the bowl). 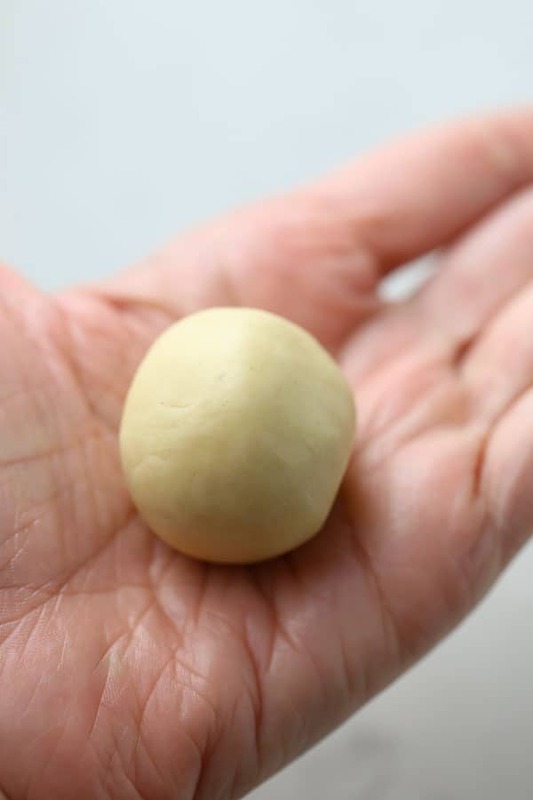 Shape dough into 24 (1-inch) balls. 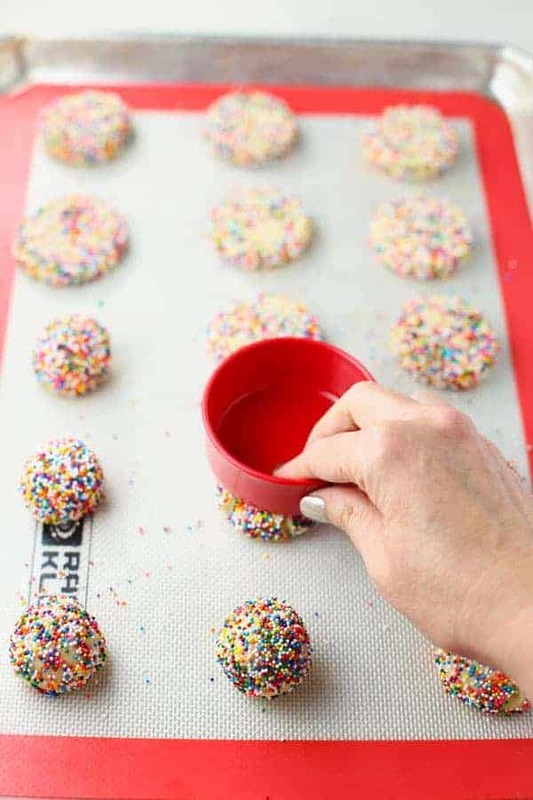 Dip balls in sprinkles and place on prepared pans. If the sprinkles aren't sticking, you can use wet fingers (dipped in a small bowl of water) and dampen the cookie dough slightly. Just enough for the sprinkles to stick. Slightly flatten the cookies with the palm of your hand or the bottom of a measuring cup (as shown in photo above). Bake cookies for 10-13 minutes or until they are just starting to turn a light golden brown on the edges. Let cool. Store covered at room temperature for up to 3 days or freeze for several weeks.